When we wrote our first guide to the best studio headphones, it quickly became one of our most popular guides on Equipboard. We received dozens of emails with people thanking us for all the research we did, and helping them land on the best set of headphones for them. However, we realized two things: One, this is a guide that needs to constantly be updated so our recommendations are always up-to-date. Two, the same people that emailed us to thank us also wanted more information about studio headphones for production and recording. Headphones seem simple on the surface, but when it comes to dropping $100, $200, maybe even $300 on a shiny new pair, there are a lot of things you need to be sure to understand and consider. So, we dusted off our headphone research goggles, and went to work to bring you the most comprehensive and easy-to-follow guide out there for the best studio headphones - what they are, what you need to know, and of course, our top 5 recommended pairs. What exactly are studio headphones? The term studio headphones gets thrown around a lot, but what exactly does it mean? Studio headphones are headphones meant to be used for creating, recording, mixing, and mastering music - in other words, things commonly done within the context of a music studio. Of course these days, a proper studio space is hardly necessary. With little more than a laptop and some software, you can record and produce anywhere at any time. Basically, you want studio headphones when critical listening is important, as opposed to more entertainment uses (like casual listening to music or podcasts, gaming, watching movies, etc.). Let’s say you’re an electronic music producer, or a recording artist, and your goal is to produce a track or demo. You’re going to want headphones that have a flat frequency response, meaning they don’t “color” the sound by artificially boosting the bass or treble. Consumer headphones (i.e. headphones & earbuds meant primarily for causal and entertainment use, and even some noise-cancelling headphones) are notorious for altering the frequency response. When the bass and treble are artificially boosted, everything just magically sounds better to us. As an artist who is recording or creating tracks - and more importantly mixing your tracks - you need more professional headphones that are honest; you don’t want any frequencies to be under- or overrepresented (again, that’s called a “flat” frequency response). Why? The idea is that if you can get your music to sound nice and balanced on flat/honest studio headphones, your music is going to “translate” well to wherever people listen to it - laptop speakers, cheap earbuds, car stereos, etc. One last thing - what about DJ headphones? Can those be used as studio/recording/producing headphones? While several of the headphones we recommend in this guide might be suitable for a live DJ setting (we’ll make a note of those), this guide is biased towards the producer in a studio setting. Variety is the spice of life, but the many variables you’ll encounter when shopping for studio headphones can make things frustrating. You also have to be careful of marketing deception. Think of it this way - when a food says “low fat” on the box it doesn’t necessarily make it good for you, the same as if a headphone says the word “studio” on the box doesn’t at all mean it’s actually a good studio headphone. With more and more people getting into music production, brands want to make headphones that seem appealing for both that, as well as casual listening. Open-back headphones are, as the name implies, more open. The part of the ear cup opposite your ear - the one that faces the outside world - is open. This means that instead of the sound staying contained within the ear cup, it can travel outwards. In short, think about what you want to do with your studio headphones. If you’re always working in a quiet space, and you want to produce and mix as accurately as possible, consider open-back. If you’re in noisy spaces, or you want to record live instruments like guitar and vocals, closed-back is better since sound leakage would be a big issue. One last note - if your primary goal is mixing, open-back headphones tend to be more accurate for that task. An over-ear headphone has the advantage of sound isolation. That makes them better suited for recording, and working in loud environments. They also provide a more immersive listening experience. Because the ear cup needs to fit around your ear, these types of headphones tend to be a little bit larger - that might make them look less cool and sleek, if you wear them out in public. The majority of studio headphones are over-ear. Budget is, of course, supremely important when it comes to selecting the best studio headphones for you. If this is your first pair of quality headphones, it might not make sense to jump straight to a $400 pair. If you’re currently producing on cheap earbuds, $150 Audio-Technica ATH-M50x are going to change your life. If you’re already using the ATH-M50x and want to upgrade, you’ll want to look at something in the $200-250 range to make a significant difference. Intended use - recording, mixing, both? Your intended use of the headphones, as well as your level of experience, kind of ties everything together. If you produce electronic dance music on your laptop, and you frequently travel and produce on the go, delicate open-back headphones don’t make much sense for you. A nice durable pair of closed-back cans is what you should aim to get. If instead you have a nice quiet home studio and you work on perfecting your mixes late at night and can’t use speakers for fear of waking up your housemates, open-back headphones would be a good bet. Ideally, it would be great to own a great pair of closed-back headphones for producing and recording, open-back headphones for mixing, and some other pair for casual listening. However, owning that many headphones is not only pricey, but also not necessarily practical. Prioritize what’s most important to you, and make your decision that way. You could read entire books on audio frequency, so we’ll stick with the very simple explanation. Frequency is measured in hertz (Hz). Humans can generally hear from 20Hz all the way to 20,000 Hz. Every headphone advertises their frequency response, which is the effective range they can reproduce of bass (on the low end), mids, and treble (on the high end). Some headphones have a frequency response that spans beyond that which humans can hear (5 to 35,000 Hz for example). This does not make their sound quality better. Make a note of the frequency response, but don’t base your buying decision solely on it. If you spend any time in forums where musicians and audiophiles hang out, you see certain questions get asked over and over again on a regular basis. Take two reddit communities for example, /r/edmproduction or /r/WeAreTheMusicMakers; you’ll only need to browse for a short time before you encounter the ubiquitous “what headphones should I get?” thread. Whether for not searching through older posts, or people wanting answers specific to their situation, the “please recommend some headphones” threads pop up weekly. We decided to create a guide using all the knowledge, advice, and guidance found in most of the headphones threads we could find going back as far as November 2012. This guide will always be a work in progress, and we’ll update it each time new headphones threads comes up on reddit. We spent many hours combing through headphone recommendation threads from reddit and tallied a vote each time a redditor recommended a headphone. We did not give a vote if a headphone mention did not imply ownership (e.g. “My friend told me the best ones to get are the AKG K240 MKIIs...”). Along with tallying votes, we took sound bites from redditors making comments and giving opinions (both positive and negative) on the various headphones. We tried to stay away from non-specific comments like, “they sound incredible!” or “best headphones hands down, can’t go wrong.” While all the comments here are subjective in one way or another, we’re only including ones that comment on a specific aspect of the headphones, and/or add something interesting to the discussion that could help make a buying decision. Note: Several user comments on the same headphone may directly contradict each other. That’s exactly part of the reason we like the approach of showing you sound bites from a variety of people. Look for trends, and use this as a starting point in your own research. We used to recommend the Audio-Technica ATH-M50, probably the most popular studio headphone on the planet before the newer ATH-M50x came along (not to mention very highly reviewed - over 5000 Amazon reviews!). The ATH-M50x being the newer model, recommendations for it have surpassed those for its predecessor. The differences between the models are not drastic - the newer ATH-M50x are slightly more comfortable and the cable is detachable, both of which are welcome features. The sound signature of the two is very similar. What’s interesting is that the ATH-M50x are actually not that flat, which is the defining feature of studio headphones! They have what’s typically referred to as a “V-shaped” sound signature, where the lows and highs are accentuated a bit, which as we discussed makes things sound a bit better than they should. So, what gives? Why are these so highly praised? While these headphones do suffer a bit from being over-hyped by producers and audiophiles, they are so popular because they are a great choice for people who want closed-back, over-ear headphones that can be used for (and sound good) for just about anything - not to mention the price is very attractive. Are they the most technically superior, flat, and honest headphones around? Definitely not. But remember, just because a headphone is technically superior doesn’t mean you’ll automatically like it better. For producing in the studio, what matters most is that you get used to the way your headphones sound. And when people get used to the ATH-M50x, the majority of the time they end up loving them. Another complaint we saw a few times is that their sound space is a little tight. We honestly don’t think that’s fair criticism, since that’s normal for closed-back headphones. And speaking of closed-back, these actually have pretty great isolation, which makes them perfect for producing on-the-go and recording when mics are around. Bottom Line: Unless you’re a veteran producer or already own a good pair of studio headphones in the $100-150 range, it’s difficult to do much better than the Audio-Technica ATH-M50x. They sound great (despite not being completely flat), they’re comfortable for long producing sessions, and their price tag makes them very attainable - for all these reasons they have become well-regarded by beginners and pros alike. The German-made Beyerdynamic DT 770 Pro 80 Studio Headphones are a stellar runner up to the ATH-M50x. In our research, most people consider them to sound superior, and better suited to music production than the ATH-M50x. They even cost slightly less. Like the ATH-M50x, they’re not exactly neutral; they have a pretty perceptible boost in the low end, and overall they have a “warmer” sound versus the Audio Technica headphones. The boosted bass actually makes these a very popular choice amongst electronic music producers who don’t mind feeling those low end frequencies more. The DT 770 gets high marks for comfort, as the velour pads are soft and pillow-like and the headphones apply very little pressure to your head and around your ears, making them ideal for long producing sessions. They look and feel rugged, and are a bit bulky - perhaps not as attractive (nor portable) as the ATH-M50x. There is an 80ohm and a 250ohm version of this studio headphone. The 80ohm version - the one that gets recommended most frequently - wins in the “ease of use” department, since you don’t need a headphone amp to drive it. To get the most out of the 250ohm version you’ll want a headphone amp, so definitely be aware of that. While neither the 80 or 250ohm versions have a flat response, it’s widely agreed upon that the slightly pricier 250ohm model is more neutral. Bottom Line: It’s interesting that many head-to-head comparisons tend to favor how the Beyerdynamic DT 770 Pro 80 Studio Headphones sound as compared to the Audio-Technica ATH-M50x, and yet the DT 770 are still lagging behind in terms of overall recommendations. The world of studio headphones evolves and opinions shift over time, so there might very well be a “rich get richer” effect going on. Regardless, if you can live with boosted bass, a more austere aesthetic and less portability, you might find the DT 770 is superior to the ATH-M50x, particularly if you’re an electronic music producer looking for studio headphones in the $100-$150 range. The Beyerdynamic DT 880 Pro Studio Headphones are fantastic, neutral sounding headphones. In number of recommendations, they were decidedly beat out by their sibling, the DT 770 PRO 80, likely for two reasons: 1) The DT 880 is in a higher price bracket, deterring those looking for headphones in that “sweet spot” $100-$150 range, and 2) not as many people are familiar or care to experiment with open (or semi-open in this case) headphones, costing these some votes. While the DT 770 and Audio Technica ATH-M50x are close contenders in terms of being closed-back, in a similar price range, and having a “V-shaped” sound signature, the Beyerdynamic DT 880 are in a class of their own. These are flat and neutral, making them very well suited for music production. They have semi-open back ear cups, which Beyerdynamic claims is the best of both open-back and closed-back. In our tests we would classify these much more as open-back, and as such you should make sure you have a quiet environment to use them in so you don’t have to worry about sound leakage. Bottom Line: While the ATH-M50x and DT 770 are excellent “all-rounders,” the DT 880 will definitely appeal more to pro users, both due to their neutral sound signature and semi-open-back design (not to mention their higher price tag). For the 250 ohm and 600 ohm versions, you’ll want a headphone amp (like the FiiO E10K ) to make sure you’re getting the best from them. The cockroach of the headphones world; the Sony MDR-7506 just won’t die (in a good way, of course). Often cited as an “industry standard,” it’s hard to know if that label is still accurate. Regardless, the utilitarian 7506s are lauded for their sound and affordability. The Sennheiser HD 280 Pro is a popular “starter” headphone for people ready to venture into the world of high-end headphones. Mixed reviews on whether these are good for the long haul, or an upgrade to something like the beyerdynamic cans is warranted (if budget permits). However, just because they’re suitable entry-level headphones does’t mean pros don’t enjoy them - artists like Odesza, Amtrac, and Rob Swire of Knife Party all use them. The rest of the studio headphones fell short of the Top 5 cut, but several still receive plenty of recommendations and are highly reviewed. The most popular DJ headphones on Equipboard, nearly as ubiquitous in DJ booths as Pioneer CDJs and DJMs. They sound great for live use, and can definitely hold their own in the studio. Lucky those that can afford these beauties for monitoring. Not Safe For Wallet. Treble - Dialed back compared to the bass. Good enough, to my ear. Style - YES. I can't recommend these enough if you want both form and function. The Sennheiser HD 201 typically appears in forum threads as a budget headphone recommendation. The Grado SR60 typically appears in forum threads as a budget headphone recommendation. The Superlux HD-668 B typically appears in forum threads as a budget headphone recommendation. 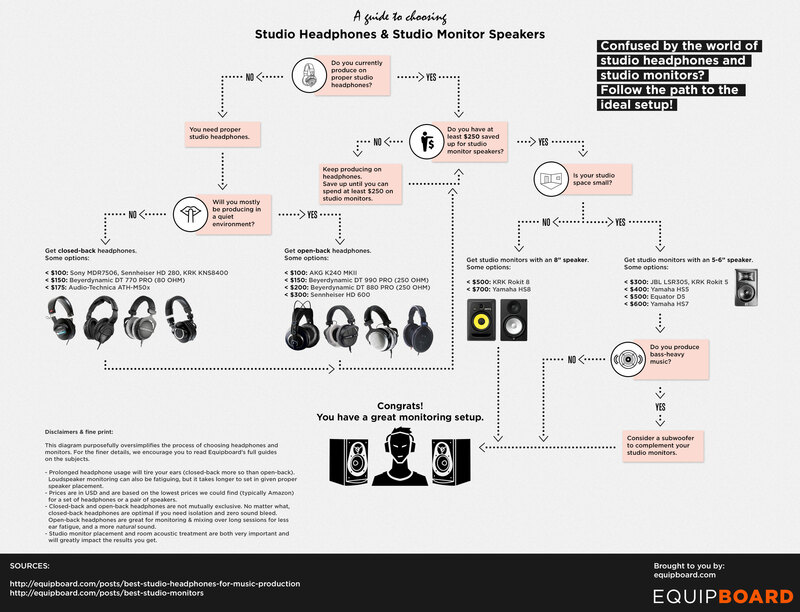 If the world of studio headphones and studio monitor speakers makes your head spin, we created this infographic to help you decide what to get! Click the preview below to see the full version. Did your headphones make the cut? We’d love to know - was this helpful? Want to drop some knowledge on any of the headphones in this list? Any other headphone you feel should be in running? Did we mess up a product name, link, or price? Use the comments below to let us know! I own a pair of Audio Technica ATH-M50 and I can tell you that it sounds amazing, very detailed and sharp. Considering in Beyerdynamic DT 880 Pro for a semi-closed experience. Thank you equipboard for sifting through the chaff and bring the best of the studio headphones. Useful for the beginner and those thinking about buying a new bass headphone. I want to come back after a year and tell you that, after having the ATH-M50 then Beyerdynamic DT770 Pro and then ATH-M50, the best headphones for mixing and mastering from my opinion are the Sony MDR-7506. I had the chance to find them in a very good shape and I was blown away. @gchiaren , Yes, are more neutral than both ATH-M50 and DT770 Pro. The highs are a bit hyped but not too much. They are more light than both, the low end is excellent and the midrange is what you need. If your mix sounds good on them, be sure that will sound good on everything. I am sure that DT880 Pro are good but I wanted closed back because I don't want to bother anybody and don't want to be bothered too by others. A really good pair of headphones that I start my mixes when I am not home are the Apple Earpods (..and yes, I am serious) . These sound so good and translate very well on my Sony MDR-7506. Happy mixing! I can agree that those ATH-M50X's are some good cans.However, do yourself a favor and buy a spare cable for them with the 1/4" connection. They short out like nobodies business after about a year of use. Been through 2 cables already... Other than that, these will give you some outstanding sound quality in the studio for tracking/monitoring and for just listening to music too.